Struggling to create Sunday school activities about generosity? If you've ever struggled to pull together Sunday school class activities about generosity, for example, on a Saturday night for the following Sunday morning, you'll appreciate all the work put into Children's Worship Bulletins. Our bulletins are Biblically based and teach basic Scripture knowledge, not doctrine. All of the significant texts and themes from the Old Testament, all four gospels and the Epistles are covered. Furthermore, each bulletin is reviewed by an education professional and tested by kids. 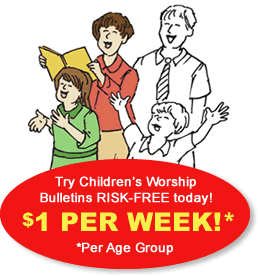 Curious about how easy it is to create activities with Children's Worship Bulletins? To show you how easy it is to create Sunday school activities for your class, we've included two Sunday school activities about generosity to share with you in this brief article. 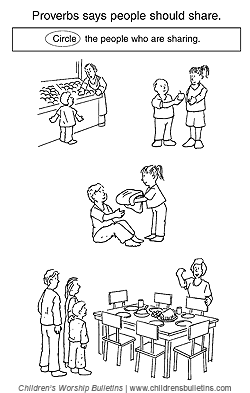 Print the "What does a generous person do?" activity page from the Children's Worship Bulletins. "What does a generous person do?" activity page for each child. Direct the children to complete the "What does a generous person do?" activity page. While they are working on the activity page, engage the children in a discussion about other activities that generous people do (e.g., serve in a soup kitchen, mow the neighbor's yard or visit the homebound). Distribute a card to each child and make the card-making supplies available to everyone. Explain, "We are going to make cards for our church members who are in nursing homes. Draw a picture or create a design on the front of the card. Then, choose a Scripture verse to write on the inside of the card or simply write a short greeting. Finally, sign your card." Have the children recite Proverbs 22:1-2, 8-9, 22-23 together to reinforce the lesson. Print the "Proverbs says people should share" activity page from the Children's Worship Bulletins. Divide the children into groups of two or three children each. Provide each group with a container of crayons and the activity page. Ask them to work together to complete the "Proverbs says people should share" activity page. While they are working on the activity page, ask them to describe other ways that people can share. Distribute one sheet of fun stickers to each group. Explain, "We are going to decorate the back of our activity page using crayons and stickers. Share the stickers and crayons so that everyone has a chance to decorate the page." Have each child sign his/her name on the page decorated by his/her group. Read aloud Proverbs 22:1-2, 8-9, 22-23 to reinforce the lesson. Explore our extensive collection of Children's Worship Bulletins and sign up for our 30-day Risk-Free trial. You'll get access to all of our bulletins — search through them by Scripture reference, topic or lectionary. Memberships are available at the low price of $4.99 per month per age group. Take advantage of our special offer to new members and join both age groups at a 50% off rate on the second group! You have nothing to lose. Sign up today!